Andy loves gnomes. When I found tiny garden gnomes in the dollar section (the gnomes are $3 a piece) in target I immediately grabbed one for him. While I was leaving the checker noticed the gnome and said that her and her friend had bought some of them and painted them up so they weren't drab one-colored gnomes. GENIUS. I don't know why, but I never would have thought of that. Thank you checker at target! 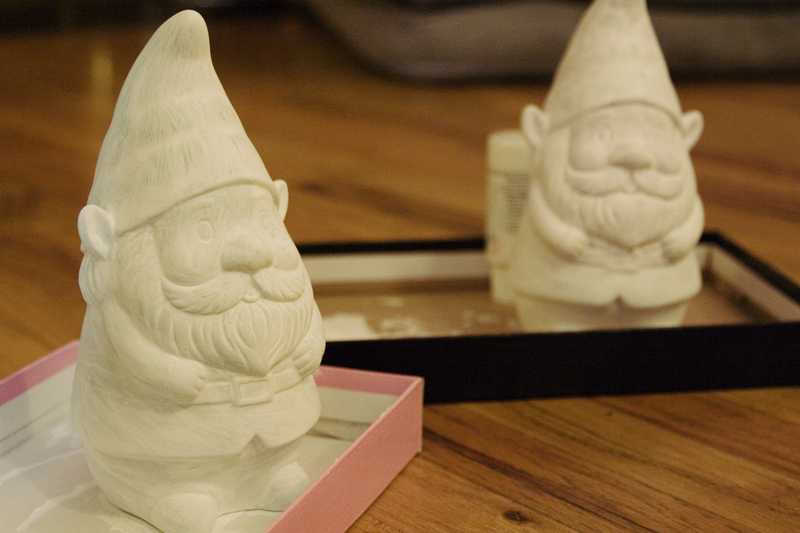 Naturally, I bought another one so we could paint our gnomes together for a cute couple activity. Well… plans changed but for the better of course! My sister ended up visiting me the next weekend and after hearing our gnome plans she wanted in on it. After a couple of stops at several different targets we found enough gnomes for her and another set for her to take home to my parents to paint. 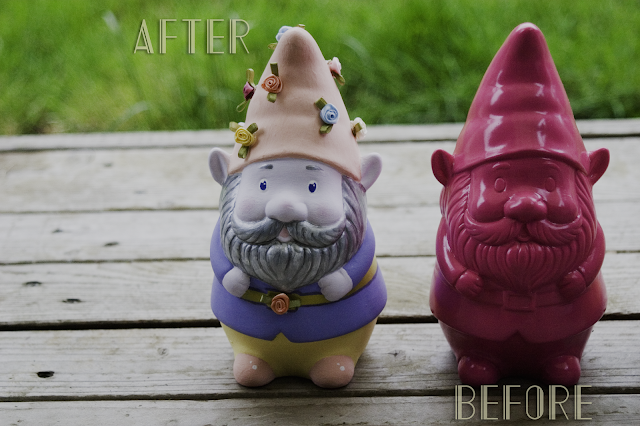 I did not want to sand our gnomes! They have a super high gloss coating when you buy them and I really didn’t want to spend a bunch of time removing that just so we could apply a base coat and then finally paint them. So we skipped it. I wasn’t sure how the paint would stick but it did! And it looks great! We contemplated whether it would be better to spray paint them white first to create a base or brush on white acrylic paint. So Hannah and I chose to brush on an white acrylic base and Andy tried spray painting. Brushing it on is by far easier and faster, but you do get brush strokes (which I think are cute and wanted mine to have). After about 3 layers of acrylic paint the white was opaque enough to start actually painting them. The hardest part was choosing colors for their little outfits. While we were laying the base coat we decided to name them. We chose a spice theme. Mine is Saffron and Hannah’s is Cardamom. (Naming them helped a little with color selection later on). 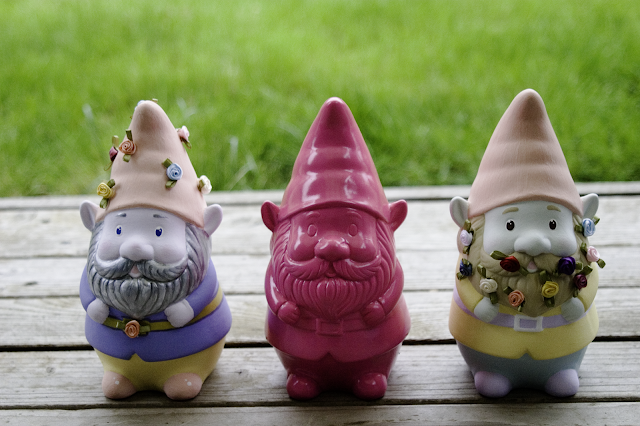 Hannah and I were going for ethereal gnomes so we chose pastel colors and then decided they needed something extra. We went and found these little silk flowers and attached them using hot glue. Once we were done we sealed them with a matte spray paint top coat. We did about 3 layers of the top coat. They ended up so much cuter than I had envisioned! (granted we took more time on them than I had anticipated). 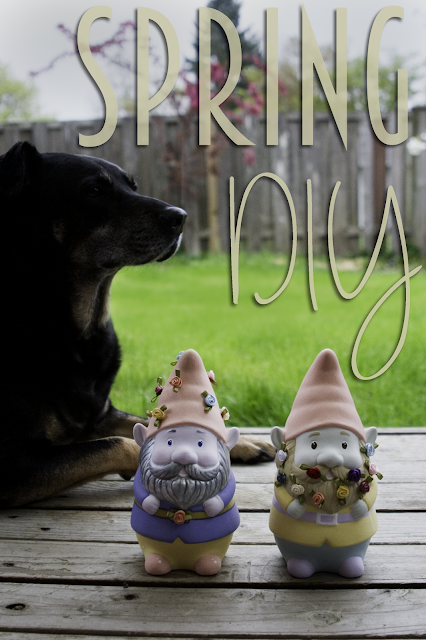 If you decide to paint your own gnome and post photos on social media please tag me! @missameliajoy I would absolutely love to see them!